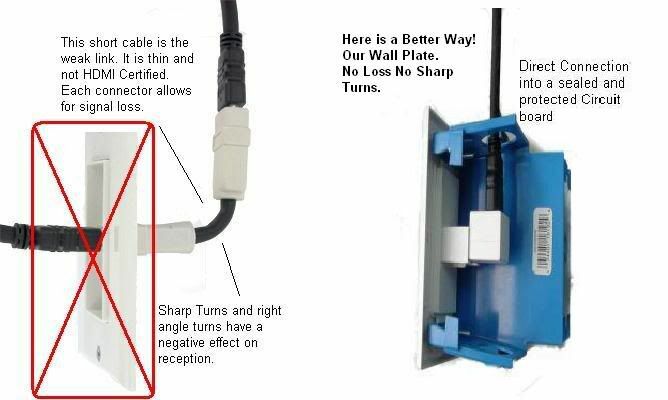 Our wall plates use a 90 degree connector in the rear directly connected to a high quality circuit board to provide a clean high speed connection between the HDMI connectors. 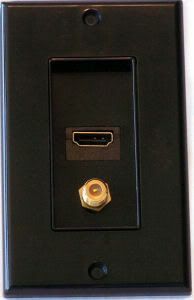 ( HDMI cable and HDMI connector on the front of the wall plate ). Some wall plate manufactures take short cuts than can cost you the high quality performance that your equipment demands. Let me explain further. Some seller’s wall plates use a 4 to 5 inch extension cable. This short cable does nothing but add insertion points for added EMF interference and signal loss. In addition most of these short cables are not HDMI certified and made of a lower quality cable. In many cases you also have to bend these cables at a 90 degree angle. It is a well know fact this is a not good and has a direct effect on velocity rates. Since you are trying to move HDTV signals that require a lot of bandwidth all of these factors on these lower priced units all work against delivering the high quality signal that the new technology and electronics require. Put the finishing touch on home theater and audio/video installations with these high quality wall plates. This all in 1 unit is ready to install. 1080p Notice - As you have likely read 1080p is Full HDTV and a real bandwidth hog. Anything other than a direct connection from device to display shortens the distance you can run your cables. While our HDMI Wall Plates support 1080p they do have limits. Depending on the quality of cable your using you can get up to 15 ft. This is great for running from a cable box / satellite receiver or blu ray up to a display. If your trying to run HDMI over a long distance you need to consider HDMI Repeaters and amplifiers at 1080p. 1080i and 720 can be run at much farther distances with no problem. The other thing to consider is quality cables. The " low price " name brand cables can be a challenge. Look at the gauge of the cable. If it's is less then 28 awg pass on it. Also make sure its copper not copper clad steel. This also greatly reduces the ability for you to get a quality picture. High Speed HDMI® Cable Compliantcable provides you a path for the future Not only does it support all of the HDMI devices on the market today and that have been sold in the past, it also supports up to 1440p that is just starting to emerge in new products like Blu-Ray disc players. With the FAST transfer rate of up to 10.2 Gigabytes per second. This will be a top of the line cable for a long time.